Tanthul's original Cyrodiil Alert add-on, updated for Imperial City with new options and features. 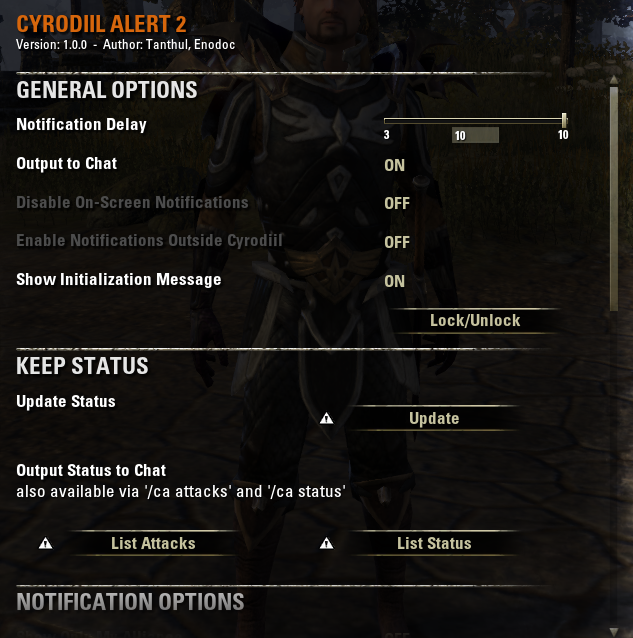 I always found Cyrodiil Alert very useful, and was sorry to see it fall into the Discontinued and Outdated category. When it no longer worked properly after Update 6, I decided to try and adapt and improve on the original and add a slew of new features in the process. Note: It is advisable to uninstall the original Cyrodiil Alert before installing this add-on, in order to avoid any unintended conflicts. Alerts when attacks start and stop on keeps/resources. Shows amount of attacking and defending sieges at the moment the attack registers on the map. Alerts when a keep or resource is captured by another alliance. Alerts about Coronations and Deposing of Emperors (Default is On). Alerts about opening or closing of Gates (Default is On). Alerts about claiming keeps for a guild (Default in On). Alerts about scrolls (taken/dropped/captured) (Default is On). Optional additional output to chat (Default is On). Ability to disable On Screen Notifications and only output to chat tab. Setting to turn off Notifications when out of Cyrodiil (in Settings menu and fast slash command toggle "/ca out"). All Notifications added as On/Off toggles in Settings. Alliance ownership shown by alliance colours in notifications (Default is On). Shows amount of sieges by alliance when the attack registers (Default is On). Option to show only notifications relevant to "My Alliance". 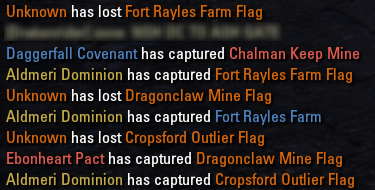 Alerts for individual keep flags (Apse and Nave) and outpost flags (Tower and Courtyard) being captured. Optional extension to include individual resource flags. Optional extension to show flags falling to the Neutral state during capture. Alerts for Cyrodiil Town capture. Alerts for Milegates and Bridges being destroyed and repaired. Alerts for Imperial City District capture. Alerts showing when position in the Campaign Queue changes (Default is On). Alerts for Campaign Score Evaluation. Alerts for Low Population Bonus. New Lock/Unlock option to move the UI window - no more moving it around by accident! Setting to turn off Notifications when in the Imperial City. Settings Menu moved into the "Add-Ons" sub-menu of LibAddonMenu-2.0. Current Status Output - Shows status of all keeps (or just those under attack) in the chat window, including current sieges, and summary of alliance and individual Imperial City access. Trigger this from the Settings menu, or slash command toggle "/ca status", "/ca attacks" or "/ca imperial". Automatically enter Cyrodiil once the Campaign Queue pops (Default is Off). The add-on does not currently function properly outside of Cyrodiil, due to the game itself not correctly updating the Home Campaign information registered on the Map and Scoreboard. CA will occasionally fail to initialize properly when first loading into Cyrodiil. "/reloadui" will reset the initialization process; alternatively, CA can be forced to reinitialize with "/ca init", and will otherwise fix itself when leaving the Border Gate area or using the Transitus network. Some long notifications may be truncated when announcements are set to display as "Major" in the ESO UI. (This is more prevalent in the German localization, but exists in the other languages as well.) This is a limitation of the base UI's announcement system, and so cannot be addressed. However, setting the notification display to "Minor" will not truncate messages, so is the best available workaround. Before being added to the main release, Lionas' JP patches can be found here. Feel free to provide feedback and suggest features you would like to see. @Tanthul, Leader of the Dark Moon guild, operating on the European Scourge campaign. Added notifications for Bridges and Milegates, which can now be destroyed and repaired. Suppression of the vanilla ESO notifications has been retired. It hasn't worked properly since the update to the announcement system, and that functionality will be available in the base ESO "Social" settings, as of Update 16. Important Note: Due to limitations in its design, the original CyrodiilAlert custom UI window developed by Tanthul (called "CA UI" since version 2.0) is now considered deprecated, and new features will not be developed with CA UI support in mind. 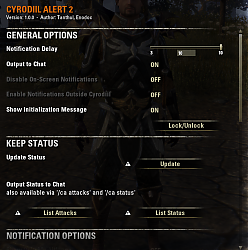 It is recommended that you switch to the "ESO UI" built-in announcement system for CyrodiilAlert if you are not already using it, and I will probably phase out the original custom alert window over the next few updates. Fixed a bug in colour definitions that was causing a UI error. Note: There was an overhaul in the API for the center-screen ESO announcement panel, so there may be some issues that I haven't picked up on. Please report any bugs you find! Known Issue - Some long notifications may be truncated when announcements are set to display as "Major" in the ESO UI. (This is more prevalent in the German localization, but exists in the other languages as well.) This is a limitation of the announcement system, and so cannot be addressed. However, setting the notification display to "Minor" will not truncate messages, so is the best available workaround. You can continue to use CA's custom UI by setting the "On-Screen Notifications" to "CA UI"
Note: You may wish to reduce your Notification Delay period if you use the ESO UI. Note: The ESO announcement panel cannot be moved with this add-on, as it is a base UI element. To move around elements of the base UI, please use an alternative add-on such as Azurah. Advertisement - Please help test my new add-on, Scaling Alert, now in beta! CA should now initialize consistently when entering a new zone -- Thanks Ayantir for the relevant function! Known Issue - CA will occasionally fail to initialize properly when first loading into Cyrodiil. "/reloadui" will reset the initialization process; alternatively, CA can be forced to reinitialize with "/ca init", and will otherwise fix itself when leaving the Border Gate area or using the Transitus network. Separated Imperial City Status from Keep Status - it now has its own output command "/ca ic"
/ca ic - shorthand for "/ca imperial"
Reversed the logical for disabling the vanilla UI notifications, for consistency with these additions; if previously you had "Use Default ESO Notifications" set to OFF, you will need to set "Disable Default ESO Notifications" to ON, and vice versa. Added option to disable the default (vanilla) UI notifications for Artifact Gates, Emperors, Elder Scrolls, and Imperial City, and use CA's own notifications instead. Many thanks to Garkin for the relevant code. Known Issue - LibAddonMenu2.0 generates an error in chat due to one of the Imperial City settings not existing yet. This can be ignored, and will fix itself when Imperial City is released. On some characters (but not all), I get IC district notifications even though I have them turned off. I have tried turning them on and then back off again; no luck. Is anyone else experiencing this issue, and how did you resolve it? Are you in Imperial City, or in Cyrodiil? Do you own Imperial City, or do you have ESO Plus (or both)? Auto-accept the queue? I'll have a look and see if that's doable. I don't see it as a feature of TweakIt, but I'll see what I can do. For a while now this addon no longer supresses the default ESO notifications. Does anyone else have this issue? Yeah I think that's been like that since the change in the API for CENTER_SCREEN_ANNOUNCE. I got the original code for that from No, Thank You and I haven't seen if anyone's updated that yet. Although it shouldn't be an issue much longer anyway, as that functionality is being added to the base UI in Update 16. So what I'll actually be doing is just removing the remnants of that feature from the add-on. after installing the new patch. Edited this comment to remove the error message now that FWSWBN is menitoning both errors which I'm also getting. The error should be fixed with v2.2.4. Let me know if you're still having problems! Last edited by Daeymon : 08/14/17 at 09:31 AM. Last edited by FWSWBN : 08/14/17 at 09:14 AM. Didn't I do all of that already in the last update? Last edited by entropy43 : 06/01/17 at 09:51 PM. Yeah sorry, I've got the patch ready to go but haven't had time to upload it yet! Due to the change in the API for CENTER_SCREEN_ANNOUNCE there may be a few things I didn't catch too. Yeah, sorry, that's a known issue with the API, so there's not really much I can do about it. The API is currently returning two blank Alliance values when a flag goes to Neutral, instead of returning the ID of the capturing alliance in one parameter and the ID of the losing alliance in the other. Your best bet for now would be to just turn off the Neutral display, since it's rather useless if that info is not being given. Ah. That's a shame. Thanks for the info! It doesn't sound like the API for this will be changing any time soon, so I've changed the way I get the info from the API instead. In today's patch you will hopefully see less Unknowns, but as a trade off I had to use a bit more lua memory as a result. Last edited by Enodoc : 05/22/17 at 05:31 AM.